How many leads are you really converting? Their engines are huge, their pockets are even deeper and you have very likely spent a big junk of your earnings with these 4 mammoth organisations. They are buying up all their competition whenever they pose a threat and will own the internet space for many a year to come, you might as well get used to it. The only way you are competing on the internet is by spending on ads with Google and Facebook and at this time Facebook is the winner. Facebook will make $60 billion at least from mobile ads by 2020, that's just in a couple of years time. You are hoping that AI and automation will save the day and actually it probably won't. The only way you have a chance is to become super personal with your customers and potential buyers. This means spending more on the front end with training your employees to become outstanding communicators and making sure you retain them for longer. Millennials will rage quit at the drop of a hat, so you better know what they value about your company and make sure you deliver this to them daily. Lead generation is going to be a much hotter topic in years to come and you will be experimenting with many snake oil providers before settling down with something that you feel happy with. Remember the customer knows when she's being sold to. The best organisations are becoming better at storytelling and linking al their teams together and sharing the same message. Here on LinkedIn in by the way is where this can be most effective. The trouble is most organisations ignore this potential and their employees LinkedIn profiles are a mess. Sorry to be so direct, but it's true. When your employees have to become better communicators they actually have to become better storytellers. Their own story and that of the company they work for. A perfect blend of the two will create trust and loyalty. Purgatory: the place to which Roman Catholics believe that the spirits of dead people go and suffer for the evil acts that they did while they were alive, before they are able to go to heaven. Humorous: an extremely unpleasant experience that causes suffering. Are you providing any kind of value? I have a love and hate relationship with funnels. I can see and love the fact that they could be of benefit to my business and at the same time I hate being in a funnel myself. I will share a recent experience with, let's just call him Nigel B. of 'Entrepreneur's Circle' and 'The Best of' fame. UK can probably guess who this person is. Nigel is a very famous UK multi-business entrepreneur and has a huge amount of knowledge in this area, I have no doubt. I was persuaded to trial the Entrepreneur's Circle a few years ago for a few months. But what happened was truly astounding, I was bombarded with not only emails, also loads and loads of paper through the post. There was just no way I could absorb all the data that was being pushed through to me, it was totally overwhelming to say the least. This was the biggest mega-funnel I had every experienced and this is quite a few years ago. I realised I had made a massive mistake and cancelled my trial subscription, unsubscribed from all the emails and thankfully it all stopped. On the 24th September 2017, I received an email from Nigel, well not him personally of course, it was from support@entrepreneurscircle.org. It read as follows. Actually, it is a very enticing email and maybe quite exciting, don't you think? Trouble is I had unsubscribed years ago, so how did I get resurrected? I certainly didn't remember downloading something from him recently. Sure enough stuff arrived in the post the following day, it was totally ridiculous and over the top, loads of #fakenews claims from a bunch of his friends etc. No I don't know if it was actually fake, but it just felt like it. It went straight in the bin. I unsubscribed from the email and declared my feelings in the text box on the unsubscribe page. I know he uses Infusionsoft and I could very clearly see that my unsubscribe was indeed successful. 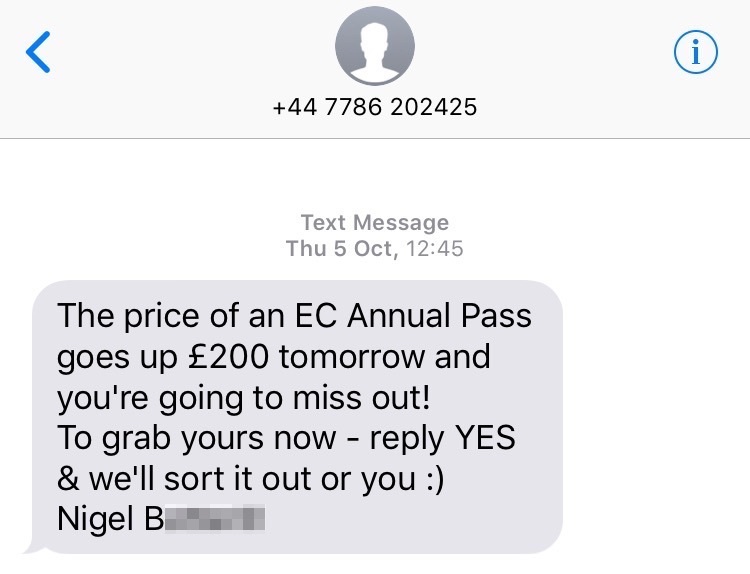 On the 5th October 2017, I received a text message from him, see below screenshot, I was blown away and fuming, #WTF, how did he get my number, plus I'm on telephone preference service (UK based service to stop spam calls and text messages), so he wasn't allowed to be doing this at all and definitely should have known better. On the 6th October 2017, I received another email, titled, "personal message..."
It was one of those video emails via BombBomb, some of you will have seen them. Believe it or not I was first introduced to this kind of video email back in 2005, even before we had broadband, needless to say it died a death then, so I'm pleased it's back, but I was not so pleased to have received this message considering I had actually unsubscribed from his database. Well of course it was obvious that they had transferred my details to a different database, the BombBomb database. I was not pleased. It felt like throwing a BombBomb towards Nigel that's for sure. Now you can probably understand why I say that I have a love and hate relationship with funnels. By the way full declaration here, I use Mailchimp automation, but in a very very different way. My objective is to add value to my network, not drive them into a funnel of any kind. I have learnt from others like Nigel that this is never the right approach and when people unsubscribe, that's it, nothing again ever! As I'm writing this, I am also familiarising myself with the new EU General Data Protection Regulations update due on 25th May 2018. Here's a link to learn more about that for EU and soon to be ex EU citizens. Yes it will still apply even after Brexit. This will mean changing all funnel approaches by all marketers in the UK (and EU), including my own little 'value automation' and I will for sure be adopting the new guidelines, I promise. Have you been hypnotised by Apple? Watching people in the London Apple store, is like watching zombies in there ideal environment. They are all staring at screens, not speaking to anyone apart from the Apple staff, who are either convincing them that now is the best time to buy or the genius team who are telling them to switch off their device and then back on again. Ironically this happened for me when I met with one of the genius team reporting my failing notes app. It sounded just like being back with Microsoft. Oh blast! Anyway, I observed how these folks were being hypnotised by their surroundings and Apple’s stuff. Their ‘best ever’ devices. Yes I'm also a hypnotised victim, all my devices are Apple, although I do not have all the latest and greatest, still on iPhone 6s and iMac 2013, I did upgrade my iPad last year to a Pro and that’s because the old one just wouldn’t function any longer. Built-in redundancy tricks by the tech industry? Anyway back to being a Zombie. Listening to a podcast by the Minimalists the other day, they mentioned that the whole reason Apple have laid out their store so that you can touch devices is that they have done extensive research that confirms that when people touch something which they desire, they have already bought it in their brain. So it will just be a matter of either convincing themselves that they want it or they just go through the process of buying having been hypnotised by having touched the device. Although I hadn't actually considered this, when I think back how I personally have been affected by this, I can definitely see how this works. Yes I am a hypnotised victim and I’m not proud of it and being a victim means I probably didn’t have any control over it. Now that I know what happens, I will for sure be on my guard, no more watching Apple keynote announcements, unsubscribing from their announcement and product emails and unsubscribing from their YouTube channel. Oh my, I just hadn’t realised how I had set myself up to be hypnotised via so many different ways. It's my own fault. Don’t get me wrong, I do enjoy their products, they deliver immense value in my life and business, I wouldn’t have been able to be as proficient in my business without the functionality, reliability and simplicity. In the main the products and their apps work faultlessly. Inevitably as they have grown bigger and bigger with billions of devices installed around the world, I guess issues do occur. My firm belief is that IT companies of any kind are in constant BETA. That must be so tough for them. The big lesson for me is to be more awake, less zombie-like and aware of any desires that may arise as a result of being hypnotised by big brands like Apple and others. This Zombie is biting back! Generally speaking most of us do seek attention, we’ve been seeking attention ever since we were a pregnancy test. And as luck would have it you have probably been receiving unsolicited attention through all your baby, toddler and teenager lives until you reach so-called adulthood. I say so-called because young people believe it’s when they reach 18, parents believe it’s not until you’re 21 and science says your brain doesn’t fully develop until you’re 25. I’m with the science community. I have first hand evidence of living with a 19-year old. Anyway let’s apply this to business and brand development. When you advertise you’re basically asking for attention aren’t you? And these days that’s what everyone is doing or planning to do. Mark Zuckerberg is very happy about this and definitely his employees, because job security is important to them of course it is. Facebook is probably going to be the largest benefactor of your need to get attention. It’s a very clever choreographed process to make you feel that if you don’t advertise, nobody will give you attention. In fact the algorithm has been changed on Facebook business pages to ensure this is the case. If you have a company page, have you ever noticed how any time you post an update Facebook follows this up at least the next day with a notification? It says that ‘when you’ve finished boosting your post X up to X number of people will see it in their newsfeed for just a couple of bucks.’ (See image example below). 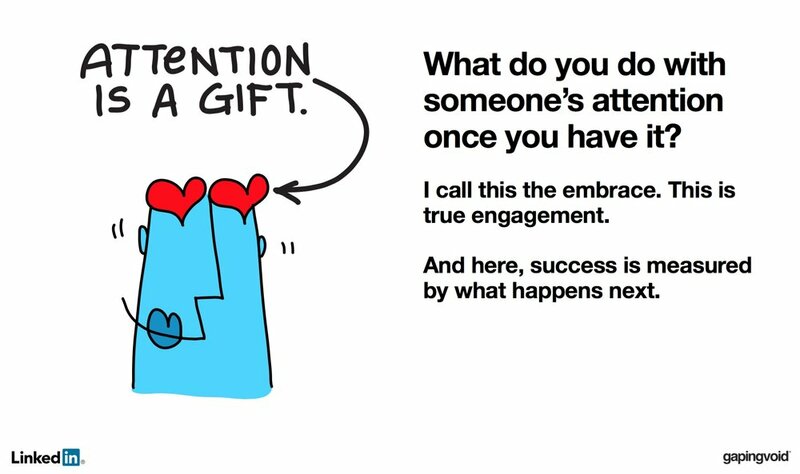 I appreciate totally that if you’re in business and you have a message or a mission you need to get people to pay attention. Advertisements are not always a great way to do this though. There are many other routes to market but here lies the problem, there are far too many routes these days and to test them all, you need a serious bag of cash to do so. So let’s just say that someone is paying attention to you, your process, whatever that may be, actually worked. They actually clicked through an advert and you got an order. Because it worked you will repeat the process again and again, continuing the advertising paradigm and many of you will even be advocating this to others, some of you might even be making a living out of training others to advertise as well. And so it grows and the advertising barons will be raking in the cash, buckets full of them. Every social network depends on advertising for its survival. You can see that the vast majority of their innovation and creativity is directed towards how to leverage their advertising engine even further. More development, updates and improvements are seen in their advertising platforms compared to the social networks themselves. The updates on those are far and few between. In fact they don’t even have great customer service, it is impossible to communicate one on one with a customer service representative, you are cornered into reading pages and pages of manuals and forums before giving up in despair. They are amongst the worst companies on the planet for their customer service, not to speak of their failures in dealing with abuse of all kinds on their sites. I’m not trying to bash social networks by the way, I know it sounds like it, I’m just highlighting that we’ve all fallen victim to them, whether it’s the addiction to them and their consistent exploitation of companies that are seeking more and more attention for their product or service. So what’s the solution? Well if I knew I’d probably be a billionaire by now, but one thing’s for sure paying social networks to advertise on your behalf for me is not the right way. Instead of seeking attention, maybe we should be inviting audiences to articulate what great would look like for them. Inviting them to share in a journey, become part of the story to greatness instead of just adding their funds to ours. Minimalism is on the rise and companies will need to become even more innovative if they wish to survive the path towards all of us needing less instead of more in our lives.